Some might associate Halloween with spooky costumes, smiling Jack-o’-lanterns, and that unmistakable annual stomach-ache caused by eating too many “fun-sized” candy bars. But here at DePaul, Halloween just isn’t Halloween without a little friendly discourse between horror experts and a lot of fascinating multimedia artwork. 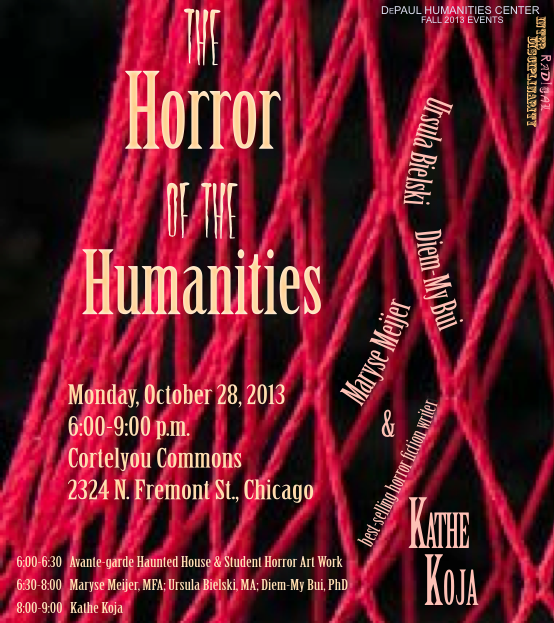 Join the DePaul University Humanities Center Monday, October 28 from 6 – 9 p.m. for “The Horror of the Humanities,” a one-of-a-kind Halloween-themed event hosted in the Courtelyou Commons on DePaul’s Lincoln Park campus. The event will be free and open to the public. Keynote speaker will be the award-winning and best-selling horror fiction writer Kathe Koja, who will be joined by a panel of other artists and scholars for an interdisciplinary and multimedia investigation exploring the relationship between horror and humanity. 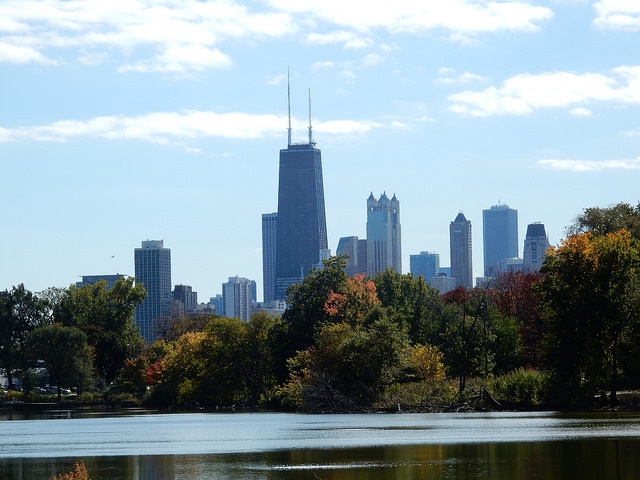 There will be lectures on gender and the horror film, the history of ghosts in Chicago, live performance art, and much more! As part of the celebration and a nod to one of Koja’s original and quite chilling short stories, undergraduate students from all disciplines are being asked to submit their original artwork to the At Eventide Red String Box Contest. Student artists are asked to give their own interpretation of the interplay between two key objects featured in Koja’s story — a box and a red string — while keeping in mind the overall horror theme of the event. The contest is open to artwork in all mediums: paintings, drawings, photographs, sculptures, art installations, and more, but submissions must use a box and red string to qualify for consideration. To enter the contest or for more information, please contact Dr. H. Peter Steeves, Professor in the DePaul Department of Philosophy and Director of the DePaul University Humanities Center, at psteeves@depaul.edu. Submissions are due October 2, 2013, by 5:00 p.m. Entries will be evaluated in mid-October, and those artists whose work is selected will be notified via email. Up to six winners will see their unique artwork on exhibit at “The Horror of the Humanities” — and receive an award of $100.